Anyone who’s been to our site for longer than 3 seconds knows we LOVE index funds. In fact we rely on index funds as our primary investments. However, some investors fear that index funds will cause the stock market to break. 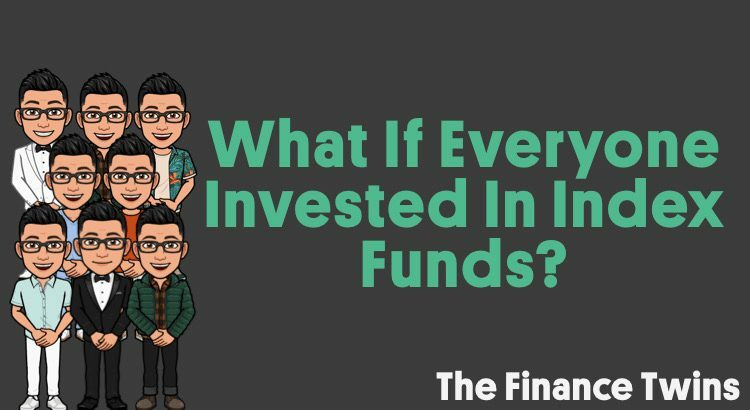 Namely, what if everyone invested in index funds? But before we dig into that, let’s define explore the benefits of index funds and then define what they are. It’s so simple to choose awesome index funds to invest in. With the advent of target date funds, you can even simplify your investments and own a single index fund. Owning an index fund like an S&P 500 index fund provides diversification because you will, in essence, own small slivers of 500 different companies, instead of only a handful. Diversification basically means spreading your money out among many investments. By doing this, you reduce the riskiness of your portfolio. In other words, you lower the chance that you’ll lose A LOT of you wealth due to a few of your investments losing value while not meaningfully lowering your returns. The power of diversification will protect your portfolio from the risk of picking the ‘wrong’ stocks. In your index fund, some stocks may go up while some will go down in value. But historically, the broader stock market has always increased over long periods of time. This is why they are such a wonderful way to invest. Here’s why you shouldn’t buy individual stocks! Could The Stock Market ‘Break’ If Everyone Invested In Index Funds? In theory, yes. But in reality that won’t be happening any time soon for a few reasons. The prices of stocks in the stock market are set via supply and demand. There’s essentially an invisible electronic middle man who matches buyers and sellers who place bids for stocks at certain prices. As the computers match buyers and sellers, the current stock price will move up and down to the current price at which people are willing to buy and sell. For example, let assume you own Tesla stock that you want to sell and it’s currently trading for $280. You are welcome to place a sell order at a price of $350. However, if no one else believes that Tesla is worth $350 then you probably will not be able to sell your shares for $350. You’ll then have to keep lowering your asking price until someone is agrees with your price. This is a high level example of how the market determines stock prices. Some people worry that if everyone decides to only invest using index funds, then the stock market will stop working. For example, if everyone buys index funds, the values of the stock prices of the underlying companies won’t reflect the fair value of the companies in the stock market. Instead the prices of stocks will simply reflect the the inflow of funds to indexes. Do Index Funds Help Determine The Fair Price Of Stocks? No, index funds don’t participate in the price discovery process in the same way as the traditional practice of buying and selling individual stocks. At a basic level, index funds are pools of money that buy groups stocks in certain proportions at the current stock market price. They don’t take a view on what the price of a stock should be. They simply buy an entire group of stocks when investors invest money into the index fund. What this means is that if every investor in the world only purchased the same index fund, then the market of buyers and sellers would no longer set the fair market price of the stocks in the stock market. In a sense, the stock market would no longer be a “market”. Remember, picking individual stocks is for dummies. 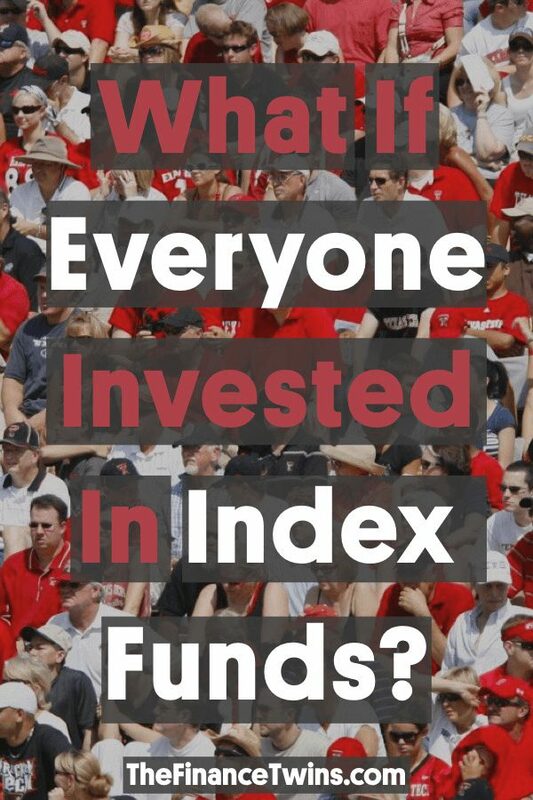 What If Everyone Invested In Index Funds Funds? In theory, it’s a valid concern that uniform adoption of index funds could cause the market to stop working efficiently. However, the vast majority of the public stock market would have to be held by index investors for the market to break down and stop working as intended. Economist Larry Swedroe, for example, believes that index fund ownership would need to account for more than 90% of all stock ownership for index funds to cause a problem. According to Bloomberg, index funds only own 18% of the stock market. In other word, we still have a long way to go before we really need to worry about index funds causing problems. Index funds were created by John Bogle at Vanguard in the mid 1970’s, so if the past 45 years are any indication, there is still A LOT of time before index fund ownership gets anywhere close to 90% of all stocks. Do You Own Index Funds? Very cool discussion on something I wondered myself. There will always be people who want to try and beat the market so I can never imagine it ever getting to 100% index funds. I agree with you, Xrayvsn! There’s always going to be someone who thinks they have an edge and will be able to beat market. It’s just so easy to be fooled by randomness. Very interesting. I’m glad I don’t have to worry. Although I own VTSAX, I was still unsure of how index funds work, but this article really helped me understand how they function, so thank you!